Neve summing box is also another slept on Gem. You get 5088 sound in a 2U unit. Plus you get silk controls to add transformer sound to your final mix or your stems. I’ve seen them go for 2200 sometimes heck even 2500US. I love mixers. I love this mixer. summing mixers are basically a way to mix your tracks together in the analog domain, instead of the digital one. some people believe that mixing tracks digitally (specifically, the summing portion of adding them together into a stereo mix) results in poor results, as far as the “width” or “sound stage” of your mix; or some variation of those ideas… they also like the idea of being able to push given channels and lightly saturate them, etc. so the idea is you route a bunch of stems of your mix (either individual tracks or multiple tracks sub-mixed) out of your DAW, into a summing mixer which then combines them, then out of the summing mixer back into the DAW to be recorded as a final mix. along the way, some will add a favorite EQ, pre-amp, etc to further color the sound. that’s the basics of it, at least. Yes it affects the sound a little bit. I call it the polishing piece to the song or album you are working on. Can you get a similar result with ITB? Yes. It’s good to compare the analog summed version and the DAW only mix. Sometimes the DAW version wins. Analog summing adds a little mojo to your final version. Sometimes you sample something and play it well on your DAW. You have the levels and dynamics down and the analog summing adds a little extra to your track. Some people who only use soft synths and samplers to make music will use summing to give the analog feel for everything and it ends up sounding good. This thing is a bit of a bargain then, no? 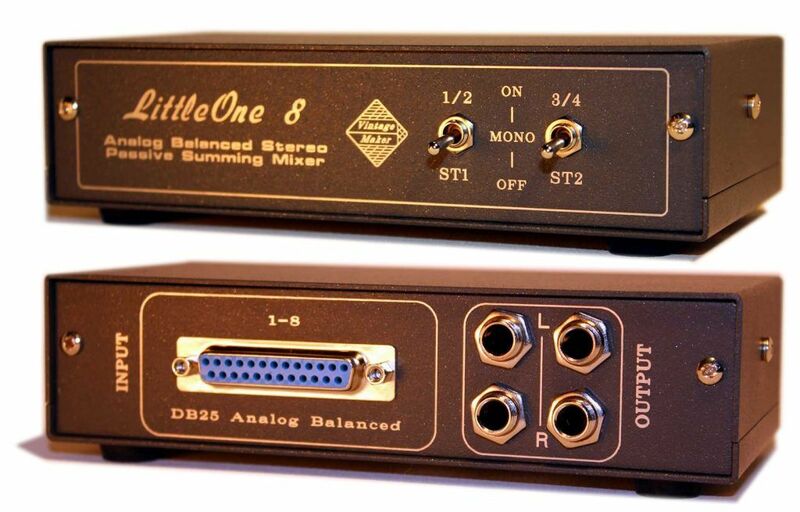 Mix you stereo channels and external inputs to foldback 1 instead of the main mix. You need to choose foldback 1 as your monitor source so you can hear what you are doing. MAKE SURE YOU ARE NOT SENDING TO THE MAIN MIX! MAKE SURE YOU DON’T SEND CHANNELS 1 AND 2 TO FOLDBACK 1 OR YOU WILL GET FEEDBACK! Patch the main mix into your DAW. You can now process your mix using both the channel eq/comp and the master bus comp. A dBox summing box is 1500US. No EQs just summing. In all fairness dBox is also a monster based on the puremix tutorials I have watched. So for 1500 you can sum and have a 4:1 compressor for master bus duties. I recently got to talk to an FOH engineer at a Lera Lynn show (true detective season 2) and I was asking him how he sets his distressor EL8X, API 2500, and 6176 for his FOH duties and he says he has them fixed at 4:1. Good to know. yes! this is exactly what I was thinking. thanks for the rundown! my main confusion was whether or not sending ext inputs to foldbacks and nothing else (not mix A or B) was possible. I know there’s a circuit diagram in the manual, but I didn’t get a chance to look through it yet, so thanks for clarifying! and yes, good pointing out the feedback concern. I knew this, but it’s important not to overlook! Dang that is one classy looking unit, seems too good to be true! I’m blown away by the modest pricing and the amount of features crammed into the small form factor. I’ve been saving up for a Soundcraft MTK 12 but I think I’ll save a bit more for one of these beauties! Never saw the appeal of their mixers without that SSL eq, to be honest. But in any case good to see them widening their target audience a bit and it will surely be a great unit for many users. It’s British, so we get to write “analogue” for once. I think it’s a great looking unit with awesome features that would compliment my set up but only if I want to be greedy. I’m going to PSs on this but I love the goal they are shooting for! As someone who produces on an MPC using stand alone mode, I’m wondering if it’s worth getting one of these to sum audio using the Live’s outputs? Thinking it will make my mixes significantly better. I’m a newbie when it comes to desks.